Color correcting light bulbs have a CRI (color rendering index) of 90 or above, meaning the colors you see under the lights are close to what you would see under direct sunlight at noon on a cloudless day, a 6500K color temperature. Color enhancing light bulbs have a warmer 2400K color temperature that more closely mimics the light given off from a fire in your hearth. High CRI bulbs are ideal for places where you want to see the true color of something, such as an art studio or craft corner. Imagine perfecting your makeup at your vanity mirror only to step outside and realize that you’ve been too heavy handed with the eye shadow or that shade of lipstick is wrong, all wrong! The same is true for businesses. You don’t want your customers loving an outfit on the sales floor only to lose the sale in the dressing room because the overhead lighting isn’t flattering or that pink blazer suddenly looks orange. For example, Soraa LED bulbs can be used in over-head track lighting to accurately render product displays or shine light on artwork in your home. Avoid looking like you’re going to the club when headed to work. Read our blog post, The Best Vanity Lighting. Shine the right light on your customers and your clothing. Read our blog post, Dressing Room Lighting and Perception. High color temperatures (7000K) are sometimes used in workplaces because studies have shown enhanced concentration, alertness, and productivity by workers in a high color temperature environment. Though this color temperature is also good for areas of your home where you want to focus on tasks, such as the kitchen or a work bench, low color temperatures are better for helping you unwind. Using color enhancing light bulbs that emit a 2400K color temperature is a bit like adding a filter on a photo. Even light bulbs with a high CRI can wash out the reds in wood finishes and skin tones while 2400K bulbs let you see more of the grains in your mahogany bookshelves or enjoy the details of your patterned rugs. Use clear torpedo lights in your chandeliers or R20 bulbs for the recessed lights in your living room to put your guests at ease and relax after a long day. If you’re lighting a modern space primarily decorated in black and white, you’ll want light bulbs in the 5000K range instead because they are not as stimulating as the 7000K lights, but 2400K light bulbs will make the whites look yellow. Keeping the color temperature in this mid-range is more like noon daylight and will still let you wind down more than a 6500K or 7000K environment would. For indirect light, try bouncing the light off the ceiling and walls instead of using direct beams. Wall washing and wall grazing are accent lighting techniques that can be used to make a room look larger. Need to change out your lighting to better fit the desired environment? 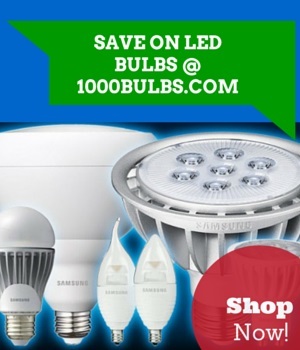 Visit 1000Bulbs.com for huge savings on LED light bulbs and more for every room of your home. Still have questions about which color temperature is right for your space? Leave us a question in the comments section. Follow us on Facebook, Twitter, Google Plus, Pinterest, and LinkedIn to hear about our weekly coupons and special promotions.